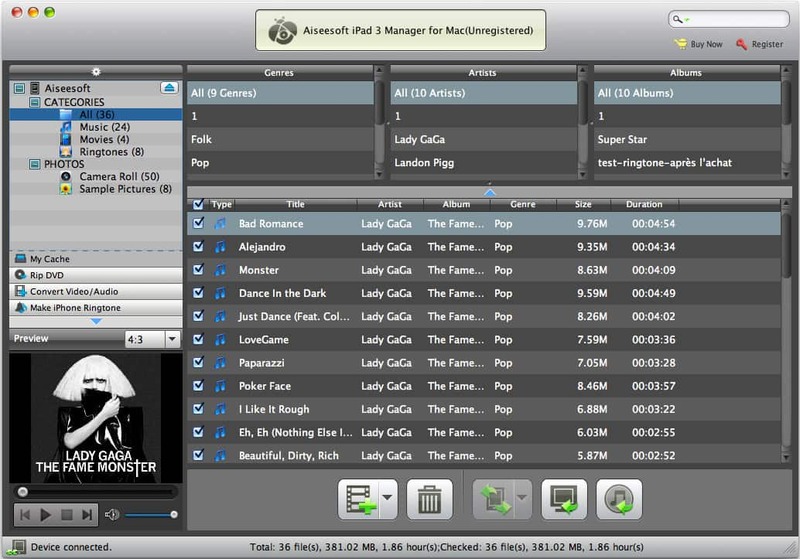 Aiseesoft iPad 3 Manager for Mac 6.1.28 無料ダウンロード - Transfer video, audio and photo files between iPad 3 and Mac without any loss. Aiseesoft iPad 3 Manager for Mac is the most professional tool for iPad users to manage iPad 3 files on Mac. It can help users import local videos, audios and images to iPad, and export iPad 3 music, movies, camera roll, and pictures to Mac without losing anything. Also it allows users to rip any DVD and convert popular video/audio files to iPad 3 compatible formats, and then transfer it to iPad 3 directly. Futhermore, it highly supports the latest iPhone 4S, iOS 5.1 and iTunes 10.6. To share files with friends, you can directly transfer files from your iPad 3 to other iPad, iPhone and iPod devices with the help of this Mac transferring software. This iPad 3 Manager for Mac can help users rip any DVD disc and convert popular video/audio files to iPad 3 H.264/MPEG-4 AVC, H.264, M4V MPEG-4, MOV, MPEG-4, H.264 HD video and AAC, AIFF, M4A, MP3, WAV audio formats on Mac. For iPhone users, this wonderful software could help you create iPhone M4R ringtone with any popular DVD, video and audio sources. Then it can import the created ringtones to iPhone directly. You do not need to connect iPad 3 to Mac while converting DVD/video/audio files. This software allows users to store the output files in My Cache first and transfer them to iPad 3 later. If the database of the iPad 3 device is damaged, this Mac iPad 3 Transfer could help users repair the damaged database automaticly. Aiseesoft iPad 3 Manager for Mac could work perfectly with all iPad, iPhone and iPod devices: iPod, iPod touch, iPod nano, iPod classic, iPhone, iPhone 4GS, iPhone 4, iPhone 4S, iPad, iPad 2, iPad 3. This software owns a user-friendly interface, which could help users make all operations much simple.